Drawing on her expertise in art, Nelda S. Lee has been thriving as a self-employed art appraiser since 1967. She initially began pursuing her passions at Texas Woman’s University and Tarleton State University, and ultimately earned a Bachelor of Arts in fine arts from the University of North Texas in 1963. She then spent five years working at Ector High School as the head of the art department before settling into her private business. Ms. Lee enhanced her knowledge by completing postgraduate studies at Texas Tech University and San Miguel de Allende Art Institute in Mexico, and coursework at The University of Southern California. She became a certified personal property appraiser through the American Society of Appraisers in 1972. Outside of academia and her business, Ms. Lee enjoys showcasing her own art too. She participated in group exhibitions across the United States, notably in El Paso, Texas, and New Orleans, as well as in Mexico. 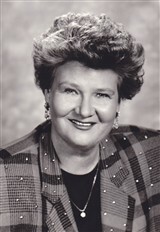 Additionally, she contributed to the collection of the Permian Basin Presidential Museum in Odessa, and wrote articles for professional journals. ​When Ms. Lee isn’t working, she enjoys using her talents to benefit the community. She has served on the board of directors and as the chairperson of the acquisitions committee for the Odessa Art Museum since 1979, and has been a member of the Appraisers Association of America and the Appraisers of Fine Arts Society since 1978. Previously, she was the Odessa appointee for the Texas Commission for the Arts, a member of the board of directors for the Ector County Cultural Center at the Texas Business Hall of Fame, a volunteer for the Easter Seals Telethon, and the board director for the Permian Basin Presidential Museum. Ms. Lee was also a member of the board of directors and the county chairperson for the American Heart Association, Inc., the president of the Ector County Democrat Woman’s Club, a member of the board of directors for the North American Art Exchange, an officer for Altrusa International, Inc., and the president of Mega-Texas Productions. In light of Ms. Lee’s achievements, she earned accolades such as the State Area Award from the YMCA of Odessa, Lifetime Membership for Outstanding Community Service from the Odessa Chamber of Commerce, the Designer-Craftsman Award from the El Paso Museum of Fine Arts, and a student grant from the Franklin Lindsay Foundation. She was also honored to be selected as a presenter for then-President Carter’s inauguration by the Texas State Society in 1977 and for the YMCA of Odessa Special Award in 1968. Further, she was featured in numerous volumes of Who’s Who in America, Who’s Who in the South and Southwest, Who’s Who in the World, Who’s Who of American Women, and Who’s Who of Emerging Leaders in America.